Viewing time: 4 min. 2 sec. The Write Question is a weekly video podcast all about writing. 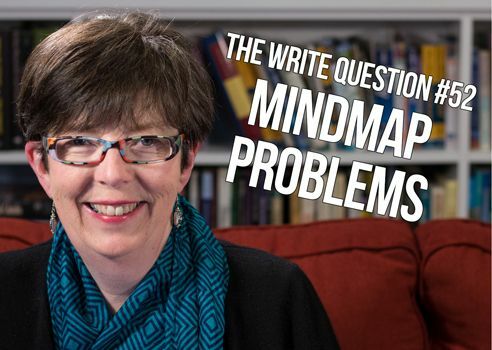 Today’s question focuses on a mindmapping problem. If you have a question you’d like me to answer, email me at daphne@www.publicationcoach.com, tweet me @pubcoach, or leave a message for me at the Skype account, The Write Question. Thanks for the question, Elizabeth. Coming up a blank or, as I like to put it, hitting a brick wall, can happen when you mindmap. This probably happens because you’re overthinking or trying to work too hard on the question. The more you think about something, the harder it becomes to figure out an answer. Here are some strategies for solving that problem. First, go for a walk before you start any mind map. I’ve talked a lot before about how fantastic walking can be for thinking, and it’s a particularly good tool for stopping overthinking. Don’t force yourself to think about what you want to write about but give yourself permission to do it. You want to get into the relaxed, day-dreamy state that is the writer’s best friend. What do New Crit and Rhetorical have in common? What do Rhetorical and Narratology have in common? What do New Crit and Narratology have in common? Do you see how splitting it up in this manner might make things easier for you? There’s no sense in making the mindmap harder than it needs to be! Doing these mindmaps should take you no more than three to five minutes apiece, so that’s a total of 15 minutes max. If that sounds like too much time, think about how a good mindmap will be able to save you so much time when you’re writing! It’s also possible that these are the wrong questions for you. Some writers need to do two or three mindmaps just to figure out what the right question might be for the centre of the mindmap. Don’t be alarmed if this happens. As writers we often have vague, inchoate ideas rambling around in our heads. That doesn’t mean the ideas are wrong or unworthy. It may mean, however, that they need some fleshing out or tweaking before they become appropriate for a paper. An initial mindmap — even one on a wrong topic — can help you identify what might be a better question for the next mindmap. Don’t ignore that possibility. Remember that one mindmap does not necessarily = one piece of writing. Another important aspect is doodling. Doodling is an excellent way to help get you into the day-dreamy state that will help you come up with better ideas. Keep your pen moving. This is far more valuable than simply staring off into space. Mindmapping is a great way to get access to new, creative ideas, but it takes a little practice to get it work for you. Let me assure you, it’s worth the effort. When mindmapping works, it’s like a little sprinkling of fairy dust. Thanks for your question, Elizabeth. I know you’re frustrated now but please give your brain a few more chances. Answers may take a while to emerge. Just give your sleeping giant a chance to wake up!